Conservatives in Washington are alleging that the gatekeepers to big media and communication channels are silencing their voices and censoring their perspectives. So far, though, the arguments aren't backed up by the evidence. Why it matters: Lawmakers using rumors to support claims of bias run the risk of turning serious policy discussions about the danger of algorithms and media consolidation into unsubstantiated political barbs. Driving the news: On Wednesday, Donald Trump's 2020 campaign adviser Brad Parscale tweeted that AT&T is positioning itself as "a weapon of the left" for pulling down a video Trump tweeted that included non-copyrighted footage from "The Dark Knight," a film produced by AT&T-owned movie studio Warner Bros. Fact check: Warner Bros., as well as many other movie studios, routinely pull down clips from content that is posted without a license, as it is a violation of copyright law regardless of who uses it or how it's used. 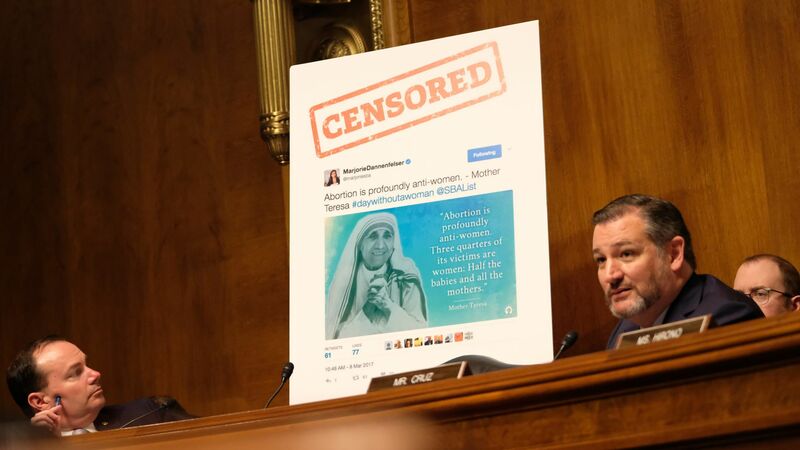 Sen. Ted Cruz, a regular critic of the companies, acknowledged at a Wednesday Senate Judiciary Committee hearing that examples of bias on the platforms was "anecdotal" but blamed a lack of "data." But, but, but: According to data from social media tracking firm Newswhip, conservative publishers continue to thrive on Facebook. Fox News, the Daily Mail, pundit Ben Shapiro's Daily Wire and Breitbart were all among the publishers who received the most engagement on Facebook from Jan. 1 to March 10 of this year. Meanwhile, Sen. Mazie Hirono, the top Democrat on the subcommittee hosting the hearing, called the charges of bias "baseless." What they're saying: Facebook's Neil Potts and Twitter's Carlos Monje, Jr., both said at the hearing that while the companies were working to get better at policing content, decisions weren't being made from a place of political bias. The big picture: The debate over bias continues to derail conversations about real content moderation problems, like the spread of terrorist content or child exploitation. Case in point: In December, Republican lawmakers from the House Judiciary Committee referenced studies whose accuracy has been disputed, as well as their own impromptu experiments, to press Google CEO Sundar Pichai Wednesday about bias against conservatives in its search algorithms. Our thought bubble: Tech executives are getting a free pass when they head to Capitol Hill because they often find themselves defending their companies against unproven accusations of bias, instead of being pressed to discuss real, proven and persistent problems around content moderation.